*** SUPERB VIEWS *** RURAL LOCATION *** DOUBLE GARAGE *** AMPLE PARKING *** TRADITIONAL SEMI DETACHED COTTAGE *** Entrance Hall, Lounge, Kitchen/Dining Room, Cloakroom/WC, 3 Bedrooms, Bathroom/WC, Double Garage, Ample Parking, Front and Rear Gardens, Night Storage Heating, UPVC Double Glazing. NO FORWARD CHAIN. REAR PORCH Stone flagged floor. External door with glazed panels to rear. UPVC double glazed window to rear. Glazed door to Hall. HALL Tiled floor, night storage heater. Doors to Rear Porch, Cloakroom/WC, Lounge and Kitchen/Dining Room. CLOAKROOM/WC Tiled floor, half tiled walls, wash hand basin with brass taps, low level WC, convector heater, light and shaver point with pulley. UPVC double glazed window to rear. Door to Hall. LOUNGE 19' 6" x 10' 7" (5.94m x 3.23m) Stone surround fireplace with black cast iron stove, wall lights, picture light, two night storage heaters. UPVC double glazed windows to front and side. Door to Hall. Part glazed external door to front. KITCHEN/DINING ROOM 13' 7" x 13' 3" (4.14m x 4.04m) Part tiled floor, ceiling beams, night storage heater, stainless steel sink unit with mixer tap, wooden work tops, cream cupboards and drawers, stone surround fireplace with cream mantle and cast iron stove, integrated dishwasher, extractor hood. UPVC double glazed window to front. Door to Hall. FIRST FLOOR LANDING UPVC double glazed window to rear. Doors to Bedroom 1, Bedroom 2, Bedroom 3 and Bathroom/WC. BEDROOM 1 13' 7" x 13' 3" (4.14m x 4.04m) (maximum width). Night storage heater, built-in wardrobe, access to loft space, UPVC double glazed window to front. Door to Landing. BEDROOM 2 12' 7" x 10' 7" (3.84m x 3.23m) (maximum measurements). Night storage heater, built-in wardrobe, access to loft space. UPVC double glazed window to front. Door to Landing. BEDROOM 3 8' x 8' 4" (2.44m x 2.54m) Night storage heater. UPVC double glazed window to rear. Door to Landing. 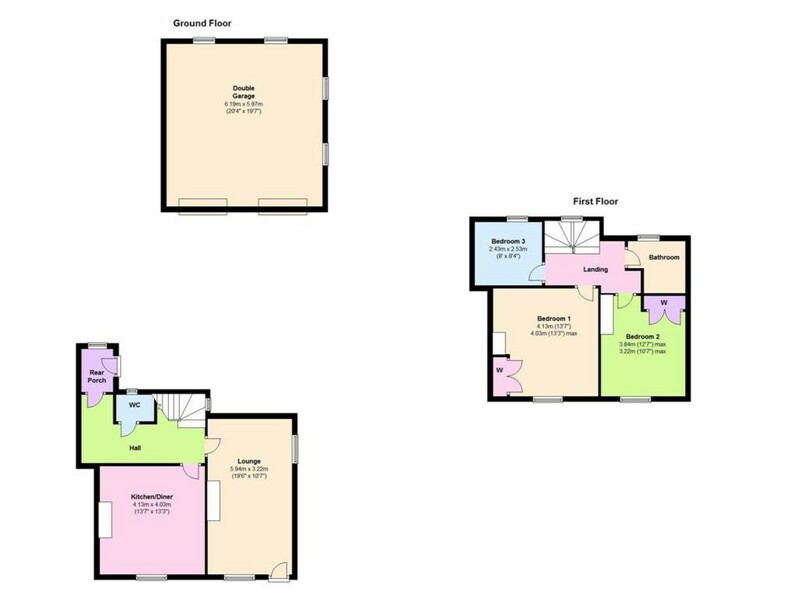 BATHROOM/WC Half tiled walls, tiled floor, pedestal wash hand basin with brass taps, low level WC, panelled bath with shower over and folding glass screen, extractor fan, ceramic toilet roll holder, night storage heater, Heatstore wall heater with pulley, wall cabinet with mirror doors. UPVC double glazed window to rear. Door to Landing. TO THE REAR Ample parking. DOUBLE GARAGE 20' 4" x 19' 7" (6.2m x 5.97m) Two pairs of opening doors. Belfast sink, drainage and washing machine points. Windows to side and rear. SERVICES Water is spring fed. Drainage is septic tank jointly shared with the neighbouring cottage (Low Lock Slack House). Mains electricity.